In Florida, Do You Have to Take a Driver’s Test When You Turn 70? Home/Blog/In Florida, Do You Have to Take a Driver’s Test When You Turn 70? In Florida, you must renew your license every 8 years if you are 79 or younger. As long as your license doesn’t expire, you shouldn’t have to take a driver’s test (behind the wheel or written) in order to update your license. Drivers 80 and older must renew their license once every 6 years. At age 80, drivers are required to complete an eye exam at each renewal. The eye exam may be completed free of charge at the DMV, or by your personal medical or eye doctor. Florida allows, and even encourages, people to confidentially report drivers who are a hazard on the road to the DHSMV. Anyone can make these reports, including your doctor, neighbor, family member, or a bystander. The DHSMV investigates reports to see if they are valid. As a result of these investigations, you may be required to retake and pass a driving exam (written and behind the wheel) to maintain your license. Also, you may have to visit a doctor to get a medical report that clears you to drive. So, while you don’t typically have to retake a driving test when you turn 70, that can all change if someone makes a report about your driving habits, or if you have too many marks on your driving record. A DHS&MV reexamination is presented to drivers who have been reported as unsafe or have an abnormal amount of tickets or accidents on their driving record. A police officer, medical doctor, family member, or just about anyone can request a DHS&MV reexamination. A reexamination may include a written or behind the wheel exam, as well as an interview with a DHS&MV authorized officer, and a vision test. 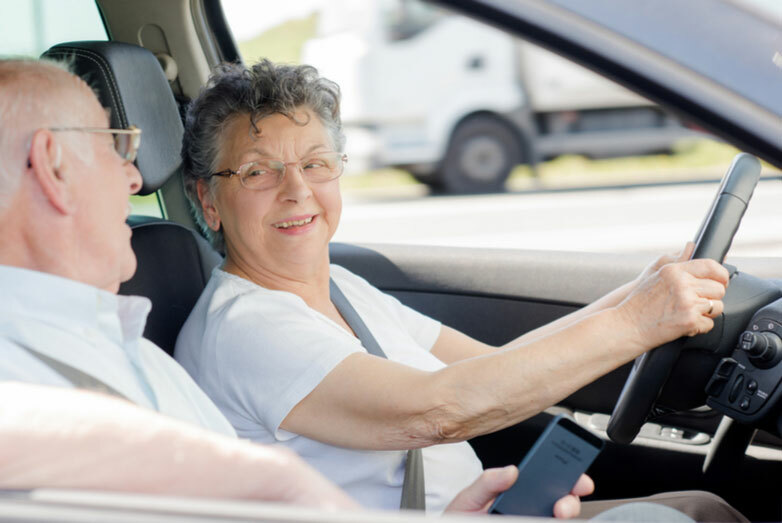 There are special driver education programs and driving schools for seniors, which can be helpful to prepare for a reexamination. After the exam, a decision is made regarding driving privileges. Florida drivers who are 79 and older are required to take a vision exam. Bring your corrective lenses to your vision test. If you think your vision has changed or worsened, visit your eye doctor first so you can get the appropriate prescription lenses to take your test. This can save you some hassles and prevent you from failing your vision test. With such a large percentage of seniors in Florida, the state works hard to do whatever it can to help ageing populations. One of the DMV’s driver-related programs is called the Florida Grand Driver. It is intended to assist seniors through driver safety awareness programs. For instance, the CarFit check entails working with seniors to ensure they can see clearly over their steering wheel, maintain proper distance between the steering wheel, and are comfortable and safe when buckled into their car. This includes easy access to the gas and brake pedals, as well as making sure the adjustable head restrains are at an appropriate height. Little things like this can make a big difference when it comes to driver confidence, capabilities, and overall safety. There are seat cushions in car to elevate driver to the proper height for a clear view of the road. By admin| 2018-08-29T22:03:14+00:00 September 10th, 2018|Blog|Comments Off on In Florida, Do You Have to Take a Driver’s Test When You Turn 70?